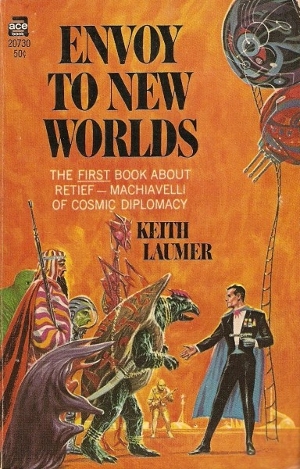 Retief, Keith Laumer’s much-loved galactic diplomat, made his first appearance in “Diplomat-at-Arms” in Fantastic Science Fiction Stories in 1960. But it was not until his re-appearance in If magazine in 1961 that he evolved into the witty, free-wheeling hero that marked the Retief series which carried on for the rest of Laumer’s writing career. Retief short stories would become a staple at If for the next decade and the first of many Retief collections, Envoy to New Worlds, was published in 1963. 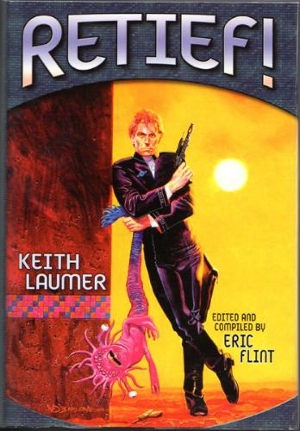 Laumer based the exploits of Retief on his personal experiences working in the United States Foreign Service where he witnessed enough incompetence and corruption to fill out forty short stories and seven novels and probably would have produced more had it not been for an unfortunate stroke that impaired his writing in the later decades of his life. His experiences infuse the Retief stories with considerable cynicism toward the diplomatic corps, an attitude that would doubtless be unchanged if he were to work in the field today, and one that might well have adequate cause in the far future twenty-ninth century of Retief’s time. Jame Retief stands in contrast to the general ineptitude of his colleagues and the bureaucracy of the CDT (Corps Diplomatique Terrestrienne). Whereas they are steadfast in their adherence to protocol, Retief is pragmatic, regularly disregarding orders to achieve desired results. Where they are ignorant of alien custom and language, Retief researches and knows his quarry. He is tall, strong, confident, intelligent, competent, debonair and quick with sarcasm. And he gets into trouble with his superiors quite often while at the same time saving the day. In many ways, he will remind readers of James Bond and Captain James T. Kirk. The Retief stories are essentially satire with humor arising from comical situations, colorful aliens, sarcastic dialog, and cynical mocking of the Foreign Service. Readers will also appreciate that these little adventures are tightly written and fast paced. 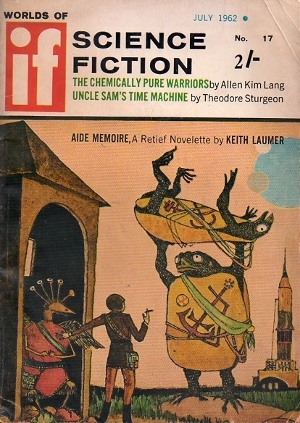 Throughout the series, Laumer tended to bounce around Retief’s timeline such that this initial collection contains six stories from various stages in his career. And although they were published in a different order, they were arranged chronologically in Envoy to New Worlds. As always, I will try to avoid spoilage in my short descriptions. “Cultural Exchange” – Things don’t seem quite right to Retief when the CDT sets up an exchange program in which a war prone people send two-thousand bearded ‘students’ to a planet without a school big enough to handle two-hundred. Fans of another Laumer series will notice the Bolo references. “Aide Memoire” – When the CDT pushes forward with sponsoring an alien youth group, Retief investigates the motives of the young thugs and the involvement of the meddlesome Groaci (a Soviet-like adversary in many Retief stories). Good world building and lots of fun. “Policy” – Retief takes over as Consul on the planet Groac and investigates a battle cruiser that vanished nine years earlier. His administrative assistant is appalled that he would rock the boat when the Groaci are being so friendly. More quality world building and I love the syntax of the alien language. “Palace Revolution” – Retief is warned to behave as the Terran Ambassador prepares to sign a trade agreement with the Potentate on a planet with a rigid caste system. Meanwhile, Retief stumbles on a group of lower caste servants planning to slaughter everyone at the ceremony. Great cynical political observations on all sides. For most readers, the primary attraction of this series is that these stories are a lot of fun. They combine humor with fast paced adventure, Retief’s memorable character, and satire that hits the mark cleanly. If you are interested in testing the waters before making a purchase, Baen has samples stories from an omnibus collection titled Retief! (omni of Envoy to New Worlds, Galactic Diplomat and Retief’s War). Retief! and Envoy to New Worlds are both available digitally (Retief! being the better bargain since it includes the later). If you are looking for hard copies, most of the series is out of print but used copies are readily available. I should also point out that I think that the later volumes in the series don’t quite hold up as well, particularly those written after Mr. Laumer’s stroke in the 1970s.